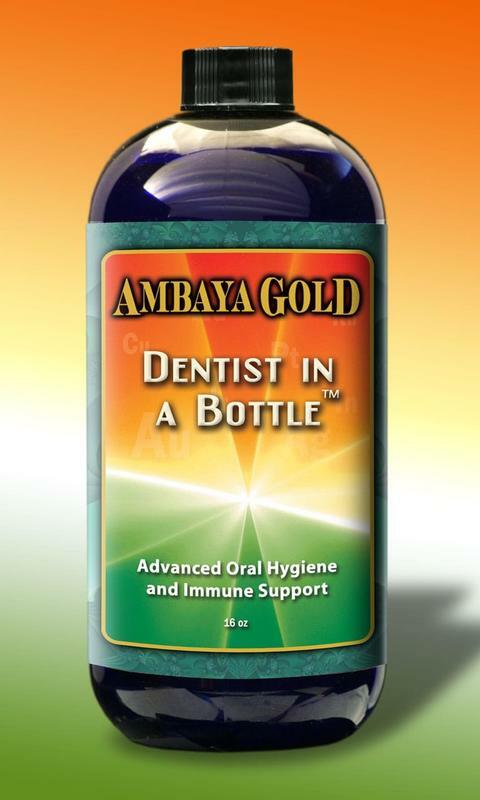 Dentist in a Bottle is a completely unique formulation that provides clean teeth and long lasting fresh breath. Created with Monatomic Silver and Fulvic, it also assists with prevention and remedial measures for gum and tooth decay. In the morning just swoosh in your mouth for a minute or so and then swallow the formula. The remedial measures will also work throughout your entire body! It's also great to brush your teeth with and helps leave your teeth and gums feel fresh all day long. Suggested use: Place 1 tablespoon (1/2 oz) of Dentist in a Bottle solution in a small container. Dip your toothbrush and brush well. After flossing, rinse mouth with the remaining solution for 1 minute, then swallow. Don't swallow after rinse for any subsequent brushings each day. Following these instructions, Dentist in a Bottle will last one month. For Acute conditions follow directions above and swallow the rinse three times a day. Note for Professionals: Dentist in a Bottle is safe for use in spray and irrigation equipment. Ingredients: monatomic activated fulvic, monatomic zeolite, monatomic silver (2000 ppm), proprietary essential oil blend (clove, cinnamon, eucalyptus, peppermint, thyme, llemon, wintergreen), stabilized oxygen concentrate, vegetable glycerin, lecithin, methylsulfonylmethane (pure MSM), plant-based phytonutrients, purified bio-photon restructured water, plant-based enzyme phytonutrients, himalayan crystal minerals, and 105 minerals, elements and amino acids - actinium, antimony, naturally occurring and beneficial arsenic, astat, barium, beryllium, bismuth, boron, bromine, cadmium, calcium carbonate, carbon, cerium, cesium, chloride, chromium, cobalt, copper, dysprosium, erbium, europium, naturally occurring and beneficial fluoride, fluorine, francium, gadolinium, gallium, germanium, gold, hafnium, holmium, hydrogen, indium, iodine, iridium, iron, lanthanum, lithium, lutetium, magnesium chloride, manganese, monatomic molybdenum, neodymium, neptunium, nickel, niobium, nitrogen, osmium, oxygen, palladium, phosphorous, platinum, plutonium, polonium, potassium, praseodymium, protactinium, promethium, radium, rhenium, rubidium, ruthenium, rhodium, samarium, scandium, selenium, silicon, silver, sodium, strontium, sulfur, tantalum, technetium, tellurium, terbium, thallium, thorium, thulium, tin, titanium, tungsten, uranium, vanadium, wolfram, ytterbium, yttrium, zinc, zirconium, plus the other elements found in sea water, alanine, arginine, aspartic acid, cystine, glutamic acid, glycine, histidine, isoleucine, leucine, lysine, methionine, phenylalinine, proline, serinine, threonine, tryptophan, tyrosine, valine. Fulvic pge silver pge indium methylsulfonylmethane (pure msm) essential peppermint oi essential rosemary oilessential thyme oil essential cinnamon bark oil essential eucalyptus oil essential wintergreen oil essential lemon oil essential clove oil essential birch oil lecithin xylitol zinc fructo-oligosaccharides (from chicory) himalayan crystal minerals, stabilized oxygen concentrate, clinoptilolite zeolite, plant-based enzyme phytonutrients, and 105 minerals, elements and amino acids including: boron, bromine, calcium carbonate, carbon, chromium, cobalt, copper, germanium, gold, hydrogen, indium, iodine, iridium, iron, lithium, magnesium, manganese, molybdenum, nickel, nitrogen, oxygen, phosphorous, platinum, potassium, rhodium, selenium, silicon, silver, sodium, sulfur, vanadium, zinc, plus the following amino acids: alanine, arginine, aspartic acid, cystine, glutamic acid, glycine, histidine, isoleucine, leucine, lysine, methionine, phenylalinine, proline, serinine, threonine, tryptophan, tyrosine, valine.